Preheat your oven to 375F and butter a 9-inch springform or removable bottom cheesecake pan (or you can use an 8-inch pan for a higher cheesecake, as I did in the video). In a food processor, pulse all the crust ingredients until incorporated. Pour the crumbly mixture into the buttered pan. Press it in tightly with your fingers or the bottom of measuring cup, so it covers the bottom of the pan. Bake in the oven for about 12 to 15 minutes. Remove and cool on a rack. Turn the oven to 325F. To make the cheese filling, beat the room temperature cream cheese in a large bowl with the sugar and salt until smooth. Add the sour cream (or yoghurt) and the orange zest and juice. Beat until incorporated. Add the eggs, beating until smooth. If there are small lumps, don’t worry about it, these will disappear in the baking. If there are large lumps, you can put the filling through a strainer before pouring it into the pan (but if you used room temperature cream cheese, there should not be any lumps). Pour the filling into the pan once the crust has cooled. While you work on your blackberry swirl, set a kettle full of water to boil. Starting at the outer edge of the cake top, squeeze the blackberry syrup on top of the filling creating a large spiral all the way to the center. 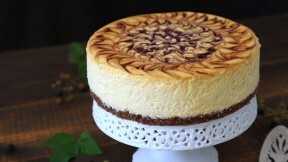 Using a skewer or toothpick, create loose swirling patterns all over the top of the cake. Reserve any remaining blackberry purée to serve with the finished cake. A cheesecake cooks best in a water bath. First, wrap some aluminum foil around the base of the pan, all the way up the walls. This is to prevent any water from seeping into the pan. Place the aluminum-wrapped pan into a large roasting pan and pour boiling water into the roasting pan until it reaches halfway up the sides of the cheesecake pan. Bake the cheesecake in a 325F oven until just set in the center, for about 1 hour 30 minutes. Once it’s done, turn off the oven and leave the oven door slightly ajar (about a one inch opening), using a wooden spoon to prevent the door from closing if you need to. Let your cake cool down slowly in the oven with the door open like this, for about 45 minutes before removing it from the oven. This slow cooling will prevent cracks from forming on the top of the cake. Remove the cake from the pan of water, and run a sharp knife around the inner edge of the pan to loosen the cake. Let it cool on a rack, then move it to the fridge where it should chill and set overnight or for at least 5 hours. To get beautiful clean cake slices, dip a sharp knife in hot water and wipe it dry on a clean towel before making a cut. Do this for each slice. Serve slices with berries and fresh green leaves on the side, with a dollop of any remaining blackberry purée.